Bigfoot Art -The Bigfoot myth goes on fascinating a generation after the other, may you believe in him or not. Bigfoot, also known under the name of Sasquatch is believed to live in the forest of Pacific Northwest region of North America, is said to be around 3 meters tall for a weight of around 230 kilos. The size of his footprints, 60cm long and 20cm wide are the reason of his nickname. Evidently, for most people the omnivorous and nocturnal ape-looking creature simply remains a fictional character; some will relate to him as a hoax while others will be more tempted by a misidentification. 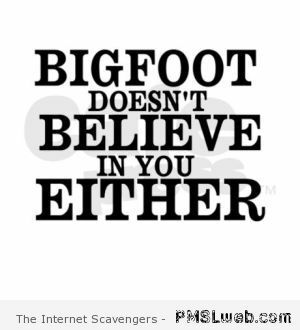 Anyway, the purpose of this post is not to debate the existence or not of the Bigfoot , but to show you a very interesting GIF sequence we came across and wanted to share with you!